Location: Spanning a tributary of the Afon Dwyryd about 1km SE of Rhyd-y-sarn at the SW boundary of this community area with that of Maentwrog. 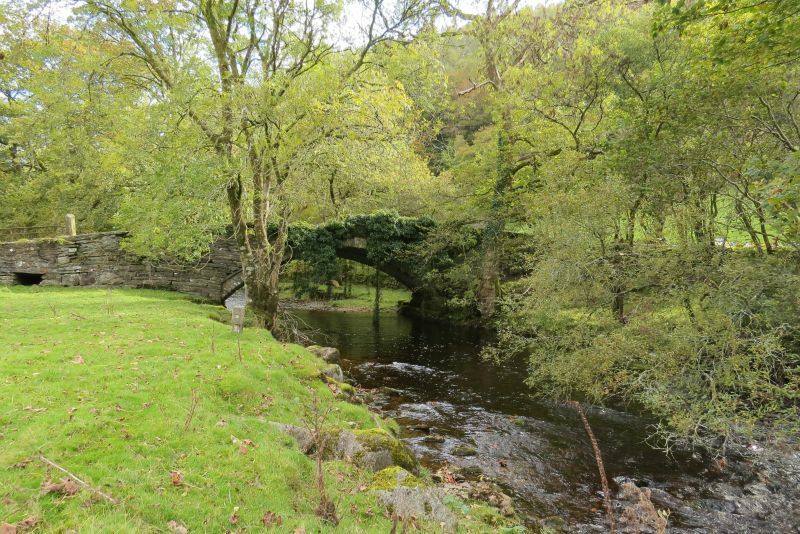 Spanning a tributary of the Afon Dwyryd about 1km SE of Rhyd-y-sarn at the SW boundary of this community area with that of Maentwrog. Spanning a tributary of the Afon Teigl, carrying the narrow country road that runs along the N side of the Vale of Ffestiniog between the A487(T) and the B4391; c.2kms ENE of Maentwrog. On the narrow country road that runs along the N side of the Vale of Ffestiniog between the A487(T) and the B4391; ENE of Maentwrog. On S side of A487 approximately half-way between Maentwrog and Gellilydan. Left (N) gable end to road, small walled foregarden to front of house. Located approximately 0.5km W of Ffestiniog village on a slightly raised terrace on the steep roadside. In an isolated rural location raised high above the N side of the narrow country road that runs along the N side of the Vale of Ffestiniog between the A487(T) and the B4391; ENE of Maentwrog. On a promontory of high ground at the western end of Llan Ffestiniog, set back slightly from the informal village square.